Obituaries and funerals from The Washington Times Herald, Washington, Daviess County, Indiana. 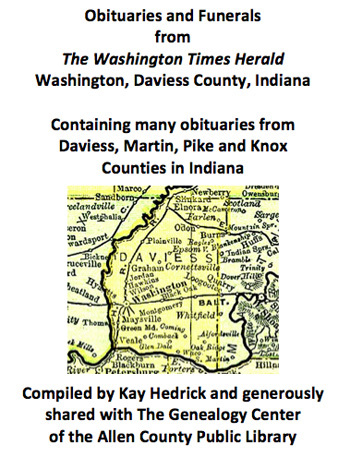 This collection contains many obituaries from Daviess, Martin, Pike and Knox Counties in Indiana. These records were compiled by Kay Hedrick and generously shared with The Genealogy Center of the Allen County Public Library and interested genealogists everywhere.